Pu Erh Tea in the "Tuocha shape"
We were in Chinatown for lunch at Phnom Penh (I recommend the Garlic Chicken Wings!) and I walked into a lovely tea shop near Ming Wo. The shop, Jane's Longevity Tea and Arts (41 East Pender Street) had traditional Chinese tea supplies...specialty tea cups and pots, formal tea sets and specialty teas from China. They also served free samples of tea in a ceremony very similar to though very different from a Japanese tea ceremony. I was looking for something to relieve my recent strange asthmatic symptoms. I have a persistent dry cough and my voice is strained from the constant hacking. I even popped a ligment behind my ribcage from coughing so hard a couple of days ago. I spoke with a man who said he was just "watching the store" because the shop owner had stepped out. He told me his father was a famous TCM doctor in China and he seemed to know a thing or two about teas and TCM. I told him of my symptoms related to asthma and he said he also had asthma as a child but does not have symptoms now. I learned that my lifelong consumption and preference for green tea might be contributing to some of my symptoms. Apparently, green tea is higher in caffeine than Pu-Erh tea and is also very cooling. 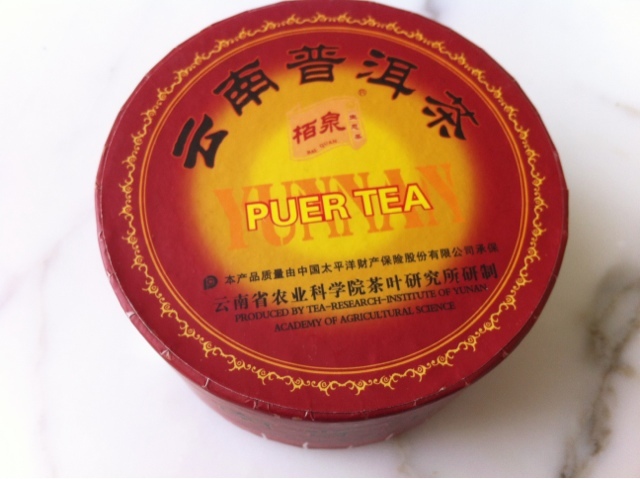 See health benefits of Pu Erh tea HERE. It's cholesterol lowering, detoxifying and can help with fat loss. Because I have recently developed asthmatic symptoms (I didn't have asthma as a child)...mainly a persistent dry cough, I am not helping my symptoms by drinking so much green tea. I usually drink from 1 to 4 cups of green tea in a day. Pu Erh Tea from Yunnan province, China. He advised me to try Pu-Erh (or Bo Lai...Cantonese pronunciation) which is a sort of fermented tea from Yunnan province in China. The tea leaves are dark and produce a red or dark tea. The one I purchased was not expensive though like fine wine, if you want to, you can pay hundreds of dollars for a Pu Erh brick that is priced by its age and region. Some bricks can be decades old. I paid $15Cdn for my pressed tea ball, which is sort of cute. It is the size of a baseball cut in half. There is a depression that I imagine is part of the pressing and molding process. The tea guy told me you take a small knife and use it to pry the tea ball and break off small pieces to use. Apparently, though Pu Erh is a dark tea, people mistake it for black tea but it isn't. He told me that it is a very special tea that wealthy people drink because it can be very expensive; it's good for your health too. The density of a brick can indicate how well it can age. The tighter the packing, the slower it will age. The more surface area, the faster the tea will age. 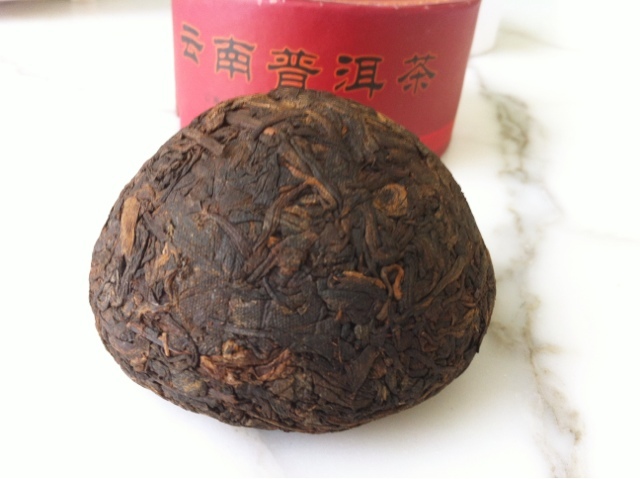 The shape of my teaball is called Tuocha bowl, or nest. When I took a small paring knife to it, I was surprised by the hardness of the teaball. It was extremely hard and difficult to break into. I broke off a tiny chunk less than a teaspoon to make my cup of tea. You steep the leaves in hot water for a few minutes and drink. It's kind of hot outside and I wanted to drink it right away so I poured my freshly brewed tea over ice in my double-walled Bodum cup. The tea was smooth and delicious. It was nothing like the Bo Lei/Pu Erh tea you get at dim sum with your meal. It was not bitter or astringent (like some I've tasted at restaurants) but almost sweet and I hear that the quality of the tea, like fine wine can fetch hundreds of thousands of dollars as quality aged tea is rare. The Pu Erh bricks have the region, year and production information on its paper wrapping. Also, like fine wine, you have to watch how you store it and many variable affect its taste. 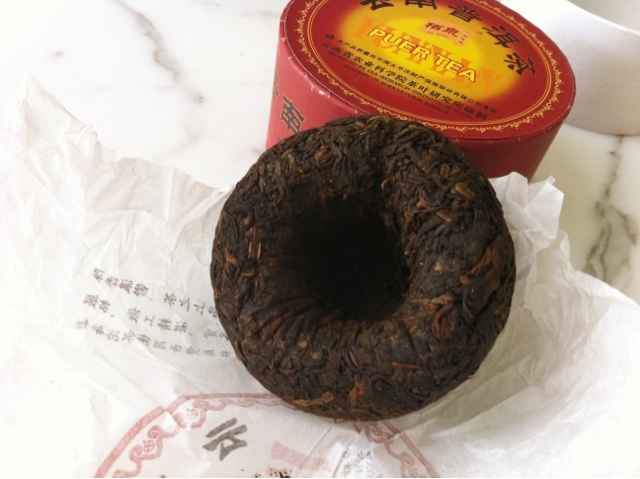 If you want to read some history about Pu Erh tea, I found this link helpful. About an hour after my first cup of the Pu Erh tea I could not believe it. The constant tightness in my throat was eased. I will be drinking this tea from now on as it seems to suit my constitution. I used to think green tea was the be-all and end-all but I guess the tea guy was right. Sometimes you need to match the foods you eat with your body type. He also advised me to limit my consumption of seafood and bitter melon (which is not a problem as I dislike bitter melon). I am so pleased to have some free TCM advice from this man. I told him my kids were plagued with nosebleeds; up to 3 or 4 a week. 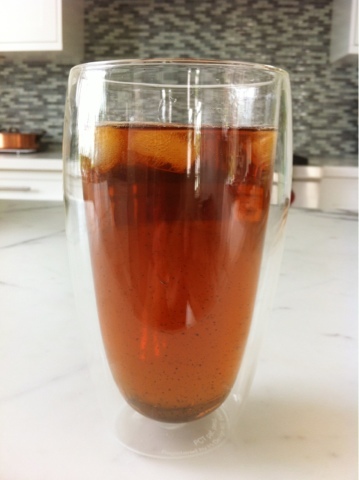 He recommended once a week to boil this detoxing tea for 5 minutes and have them drink it. Because of its medicinal flavour from the goji, I asked if I could add sweetener and he said maple syrup or honey would be okay. I'll let you know how the detox tea works. Chinese medicine can definitely help. I've been suffering with post-viral fatigue since the beginning of the year and it wasn't until I went to an acupuncturist who's also a herbalist, that I started to improve. Western medicine said that all I could do was rest, Chinese medicine was much more pro-active. 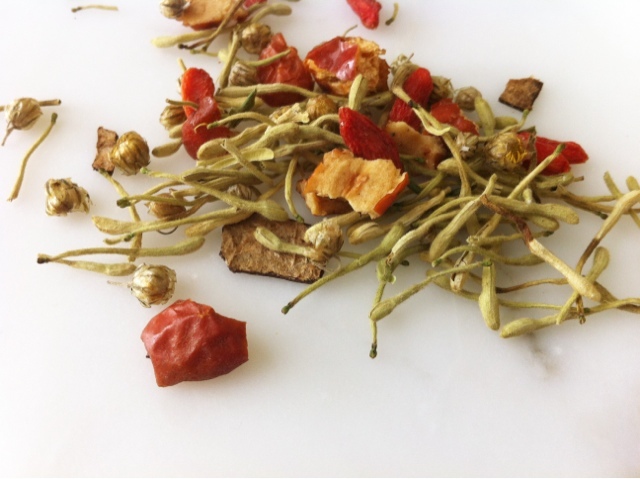 When I was little I drank chinese herbal tea for my eczema and it worked absolute wonders! i have heard of pu erh tea! also, like little loaf i have raging eczema. maybe i will have to try this. definitely let us know how it goes, and i hope you feel better soon! I'm surprised the TMC didn't tell you not to drink cold drinks if you have asthma or "cold" cough (cold cough is a cough without mucus). Only warm drinks as long as you are coughing. So no green tea or cold drinks for as long you are coughing and you will get results faster from your puerh. Also try at least one or two cups of Lo-Han-Kuo and xiasangju mix every day to prevent new infections :) Also for me the true lifesaver was fu cha. Best of wishes! thx for the advice...which I've heard a zillion times from my mother! lol. I'm not into any of the old bitter teas that are prescribed by TCM doctors because I was traumatized early in my childhood. Every time I smell or taste it, I have an auto-gag-reflex. You can imagine why. So I'd rather not. haha. I am no longer "cold" as I've stopped drinking green tea and switched to pu erh. I can drink cold drinks no problem too now. the lo han kou and xiasangju are not bitter at all but a little bit sweet. I drink up to three cups a day during cold season to stay away from any nasty bugs. I'm a recent chemo patient and I find it works very well for my immune system. And if I can't afford fu cha or toucha pu erh I drink hong cha.